Last night a hundred or so lucky fans made their way to Sonos Studio in Los Angeles to get a free intimate performance from Miguel. The fans got the heads up about the performance by listening to Miguel’s station on Pandora and the lucky ones were able to procure an invite. The invite-only show doubled as both a thank you for supporters Pandora and Miguel as well as promoting the high-quality speakers and sound systems offered Sonos. Those in attendance were offered a free trial of a couple of Sonos Speakers and a Pandora subscription. When Miguel finally took the stage, he was backed by a 3-piece band and launched right into familiar tracks from 2010’s All I Want is You and 2012’s Kaleidoscope Dream. The night, however, focused on music from his new album Wildheart. The 45-minute set did include older songs like “Sure Thing” and “How Many Drinks,” but “Waves,” “Face the Sun,” “Coffee,” and “Hollywood Dreams,” from the new album was the bulk of the performance. 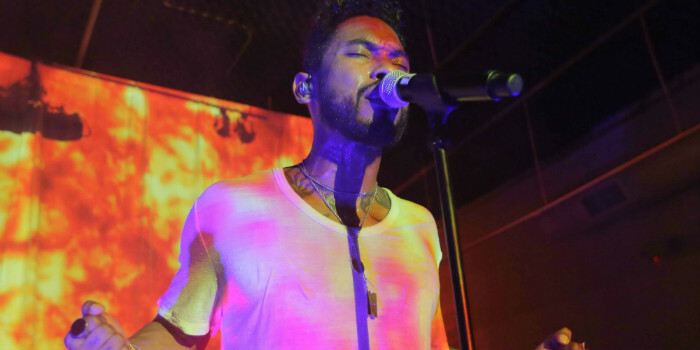 Miguel chatted with audience, encouraging people to be themselves and buck the trend of “normality,” singing the first few bars of “What’s Normal Anyway?” That seemed to be theme of the evening, and probably his upcoming tour which launches this fall.